Fiction – Kindle edition; Vintage Digital; 352 pages; 2008. Translated from the Norwegian by Charlotte Barslund. The disappearance of a young child and the ensuing police hunt is a well-worn trope in crime fiction. I’ve read so many crime tales of this nature I no longer bother with them, but I decided to make an exception for Karin Fossum’s Black Seconds, because she’s an author I can trust to cover such a crime in a compassionate, thoughtful way. In the past I have read many of Fossum’s books, both her standalone titles and those that are part of her Inspector Sejer series, and she has an acutely perceptive eye on what happens after the crime is committed. Her novels usually tackle the psychological impacts on both the victim’s family and the perpetrator, highlighting how criminal acts can never be seen in isolation and how they cast long shadows on a wide circle of people and the communities they inhabit. These themes are also present in Black Seconds. In this story, set in rural Norway, nine-year-old Ida Joner doesn’t come home after a trip on her bike to buy her favourite magazine and some chewing gum. Weeks later her distinctive bright yellow bike is found abandoned, but Ida is still missing. Her single mother, Helga, can barely hold things together, even with her married younger sister Ruth by her side offering moral support. Ruth’s own children, 12 year-old Marion and 18-year-old Tomme, are struggling to cope with the reality that their cousin is missing, while Ruth is worried about Tomme’s growing friendship with a local drug pusher and his admission that he crashed his car on the same night of Ida’s disappearance. When Ida’s body does eventually turn up, the post-mortem reveals an unusual death, where nothing quite seems to add up. Figuring out how she died as well as who committed the crime is a major focus for Sejer and his colleague Jacob Skarre, but for the reader it’s pretty easy to figure out what happened and who did it. The unhurried pace of the novel, written in Fossum’s typical sparse, bare-as-bones prose, may bore those looking for a thriller with twists and turns aplenty. That’s not what this book is about. In its measured examination of those drawn into Ida’s orbit, whether they be family or otherwise, it reveals how crimes are not always malevolent or premeditated and that good people can make bad decisions with lifelong repercussions. It’s also a detailed look at the burdens of guilt and the psychological impact of living a life bound up in lies, as well as being a fascinating account of an inspector’s thought processes and empathetic tactics used to solve the crime. 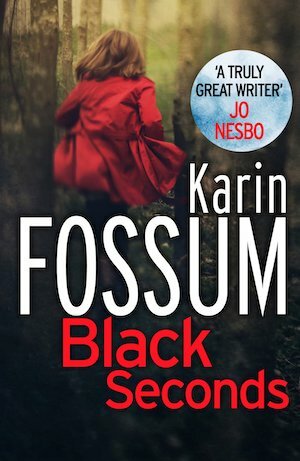 Karin Fossum is always worth a read, and Black Seconds only cements that reputation in my mind. This is my 10th book for #TBR40. I bought it on Kindle last October when it was just 99p (as part of a “deal of the day” offer on Amazon) and read it last week when I was looking for a “palate cleanser” after a steady diet of heavy literary fiction.